Slender Gerardia is a native annual that grows to about 2 feet in height. Note the slender, linear leaves and overall dark color (green to purple) of the foliage. The leaves are opposite and entire. The flowers, borne on long pedicels, are light to dark pink with purple spots inside. They are tube-shaped, and similar in appearance to foxglove and snapdragons, to which they are related. Each flower has 5 lobes: 2 above and 3 below the “mouth” of the flower. The flowers of slender gerardia open in the morning and close at night. The plants in this gallery were photographed in late afternoon, at which point many of them were already wilting. 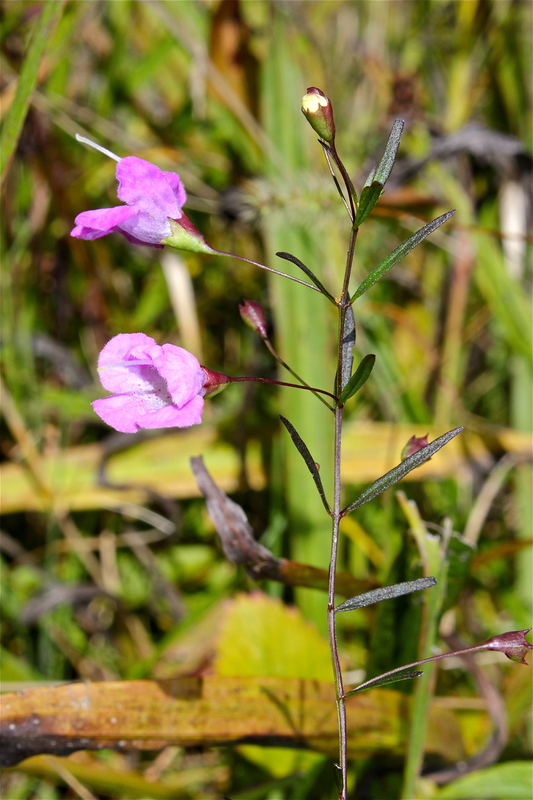 Look for slender gerardia growing in open areas in from August until October.